Five years after Davie County residents voted overwhelmingly to pass the Parks and Recreation general obligation bonds, construction is now underway on Phase One of the new Davie County Community Park being built at the former site of Davie County High School. “From contemplation and initial dialogue to the creation of shared vision; from deliberations to the formulation of strategies, and through communication, collaboration, and coordination, our design team has made the vision of our Davie residents happen. The new park will contain most of the key features that Davie County residents specifically identified as top priorities,” said Moore. 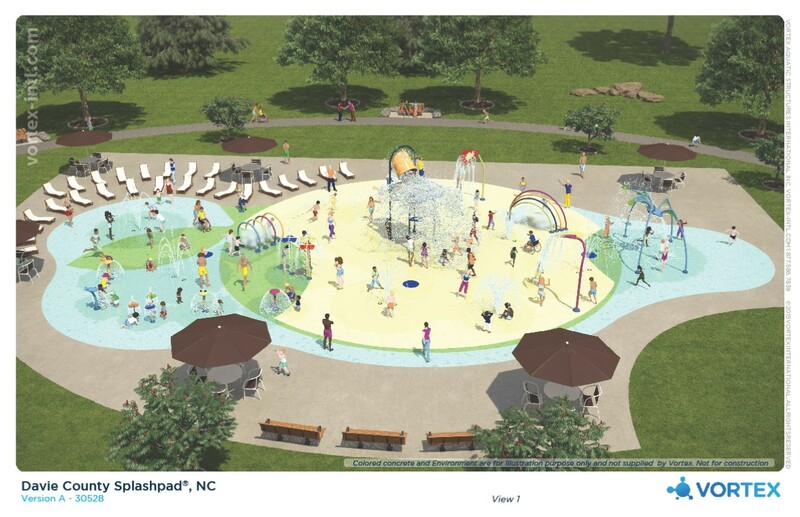 Slated to be completed Spring 2020, the County-owned park’s initial Phase One facilities will include the largest Vortex splash pad in North Carolina, an amphitheater and civic green, an inclusive playground, a 310° baseball/softball field, a dog park (for small and large dogs), walkways and trails (including a boardwalk), a horseshoe and bocce courtyard, a 625 square foot medium shelter, and gymnasium renovations along with a number of other infrastructure elements. The County also secured additional support from the General Assembly to reconstruct the old parking lot which will include a road course for local law enforcement and emergency services vehicular training. Additionally, the County is pursuing grant funding from the Parks and Recreation Trust Fund (PARTF) for other park features that would become part of phase one construction if successfully awarded. 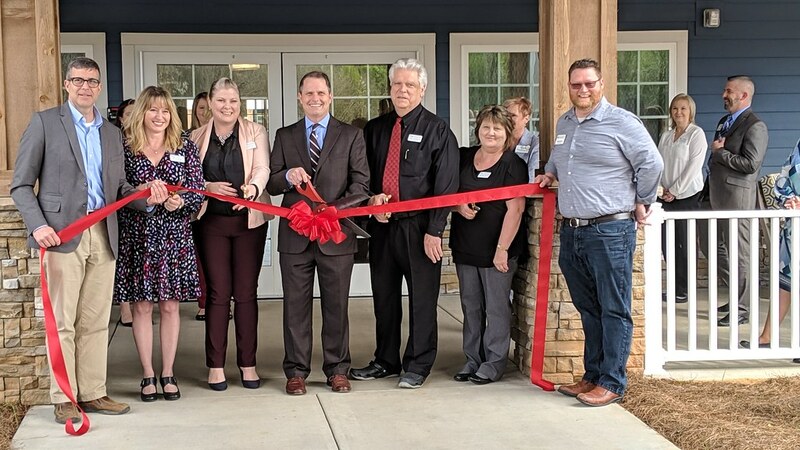 “We want our residents to know that this new park will not only lead as a regional destination park, but will serve as a joyful experience through recreation and play for individuals, families, seniors, and pets too!” he added. The citizens of Davie County, this is your park and we want you to be proud of it! The Staff of Davie County, from our Administration Office, Finance, Development Services, to our Recreation and Parks team. Our dedicated team, including members of the Recreation and Parks Advisory Board, consultants, McAdams, Fuller Architecture, Davie Construction Co. and Vortex. To the first sponsoring organization, The Davie Community Foundation, we extend a thank you for their ongoing helpfulness and support for a Healthy Davie. Recreation and Parks is seeking resident input on the PARTF application. Public input meetings will be held at the Brock Recreation Center on North Main Street in Mocksville on Thursday, March 21st from 6-8 p.m. and on Saturday, March 23rd from 9:30-11:30 a.m.
To follow the development of the community park, visit www.daviecountync.gov/DCRP and click on the tab labeled “Davie County Community Park”. Davie County Recreation and Parks can be reached at 336-753-8326. Training is a valuable way to improve business performance, increase profits, and boost staff morale. Training helps a company stay ahead of competitors and keep up with the latest industry and technology changes. Ensuring that your employees’ skills and knowledge are up-to-date can grow your business and boost its competitiveness. Training has many benefits for your staff: acquiring new skills, increasing their contribution to the business, and building self-esteem. Employees who receive the necessary training perform their jobs more effectively. Training also helps prepare employees to grow within their companies as they aspire for positions with increased prospects and pay. 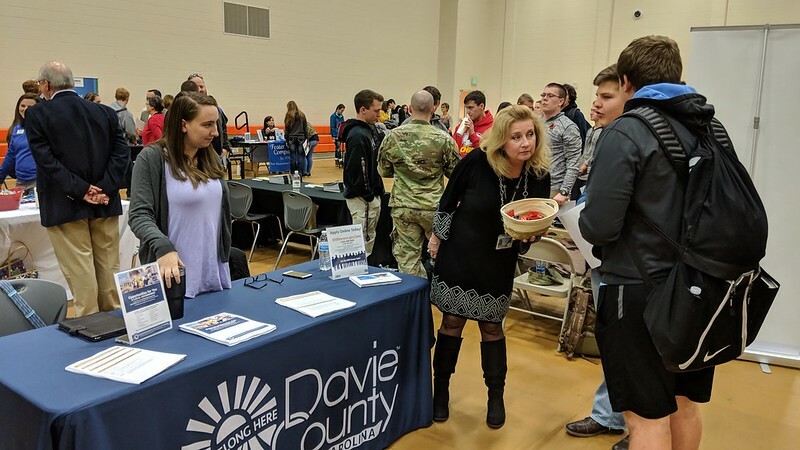 When companies plan their employee’s training schedule, Davidson County Community College (DCCC) makes a variety of options available, such as on-site or off-site, training professionals or internal resources, formal classroom instruction or on-the-job training. DCCC has training options to meet all of your needs. DCCC’s Workforce Development and Customized Training programs can provide classes that meet most of a company’s training needs, anything from OHSA safety, CNC machining, welding, and LEAN Manufacturing to notary certification, computer skills, and leadership training. Elizabeth Kilby, Program Director Customized Training and Workforce Development at the Davie Campus, and Carolyn Davis, Director of Customized Training and Workforce Development at DCCC’s Davidson Campus, meet with representatives of local companies to determine specific employment and training needs. DCCC offers classes in the areas of business and computers, construction, manufacturing and transportation, inspection and licensure, leadership, safety, continuous improvement, hospitality, health and wellness, advanced law enforcement training, fire and rescue, and EMS, EMT, paramedic programming. The college also offers around 230 online classes that run for eight weeks and can be offered for as few as one student making the classes accessible to even the smallest companies. A complete list of options can be found at https://davidsonccc.edu/academics/continuing-education/. Kilby and Davis will also assemble a customized program if a company has multiple or specialized needs that can’t be met through continuing education classes. Through either method, classes that don’t require special equipment can be offered at the college or at the industry and do not have to fit into a traditional semester model. Classes can be offered during the day, at night, or weekends based upon an instructor’s availability. The college even has an advanced manufacturing mobile lab that can be brought onsite for training when needed. Classes can be started quickly if there are enough students and an instructor and class space are available. As an added bonus, Kilby and Davis handle all of the registration and paperwork. I was a long-haired 11th grader in Carolyn Beaver’s journalism class at Davie High School when I decided that would be my career path. Journalism. Newspaper work. I never got rich, but I don’t regret that decision. And the 11th grade is not too early to begin thinking about a career choice. Heck, eighth grade isn’t too early, either, just don’t set anything into stone at that young of an age. As editor of the student newspaper at Chowan College, I learned quickly that when you’re the editor of a newspaper at a Baptist college, it’s probably best not to criticize the North Carolina Baptist State Convention. But I did. My professor loved the editorial, but the college administration did not. Chowan had just started a newswriting and advertising two-year degree program, geared towards those of us who wanted to work at a community newspaper. The only professor on the news side was a retired editor of a major daily newspaper in the Tidewater, Virginia area. He didn’t last long at Chowan, either. Then it was on to East Tennessee State University to study mass communications (journalism). I had a work study job on the student newspaper there, and yes, I thoroughly enraged the university president with an article. It was his fault for refusing to answer simple questions, but he didn’t see it that way. To get a degree in journalism at East Tennessee, students had to complete a semester as an intern – at a newspaper, magazine, television station or other news outlet. It wasn’t a suggestion, it was a requirement. Get your own job or they would find one for you. I worked for the Johnson City Press Chronicle for a few months, and received invaluable, real-world training there. I even wrote a couple of top stories for the Sunday edition. That was the best requirement ever. I’ve seen too many students graduate from the University of North Carolina School of Journalism with no idea of what it is like in the real world. They could write, but were lost at a county commissioner’s meeting. They could write, but a deadline put them in a panic. They could write, but cringed when an editor made changes, whether for clarity or length. I was lucky to know my career path early, and Davie County is on the right track in training our students for the workforce. Terry Bralley and the Davie Economic Development Commission continue to amaze. Pretty much full on the employment scale, the director of economic development didn’t stop in his efforts to recruit new industry, or help local industries expand. But he added staff to help keep more young people here. Carolyn McManamy, former president of the Davie County Chamber of Commerce, is heading the project, and I’m sure she will do well. The idea is to get our students and teachers familiar with local industries, learning their needs, learning the skills they expect from employees. The hope is that teachers will teach more of these skills, and students will find something they’re interested in and stay in Davie after graduating from high school or college. It’s a great idea. Sending their kids to college is every parent’s dream, but when the student graduates with no real-world job skills, that dream can turn into a nightmare – a financially crippling nightmare. It is not entirely the fault of the student and parents, many of whom believe that a college degree in itself is a path to career success. It is not. Blame some of the colleges that offer degrees that give the student little or no hope of finding a job. Yes, I believe in a well rounded education. College students should be exposed to all types of information, but there should be more of a focus on job skills. Students, find a career choice that suits your desires, and learn the skills it takes to be successful in that career. Even if you change your mind later, those skills will be with you forever.